White Horse between Rt561 & Evesham remains closed while crews work to clear the large downed tree and wires. White Horse Rd remains closed between Rt. 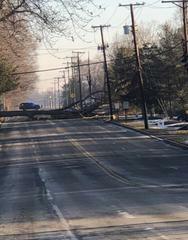 561 and Evesham Rd due to the large tree down along with wires. Utility crews are on location working to clear the road. Please continue to use Evesham Rd or Centennial Blvd as alternate routes. Residents of Staffordshire should continue to use Laurel Oak Road. We will update when the roadway is open. Thank you all for your patience and cooperation.